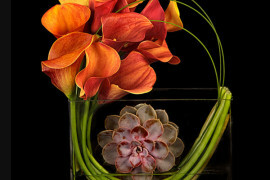 From the styling to the menu, don’t hesitate to stick with a few key items and savor each one. 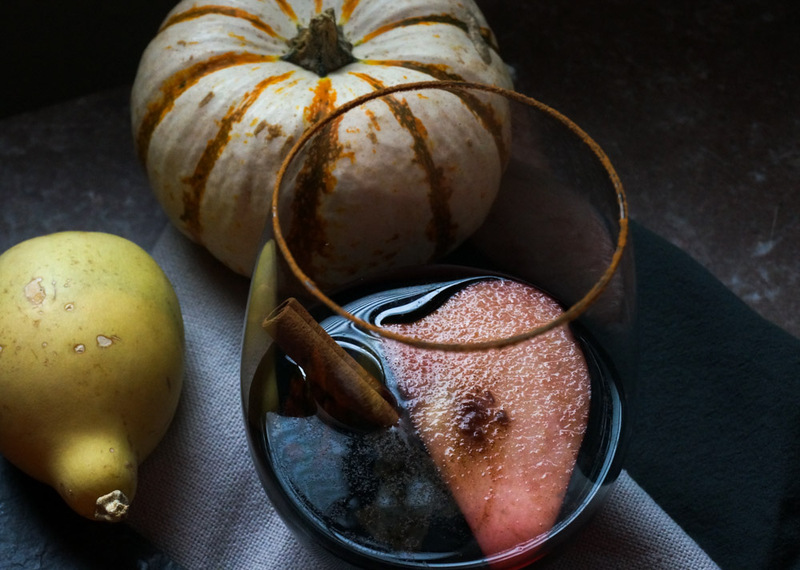 At the top of the post, we see a fall sangria, which celebrates the perfect bend of cinnamon, apples, red wine and Grand Marnier. A dash of orange juice and sliced citrus fruit can jazz up this concoction as well. 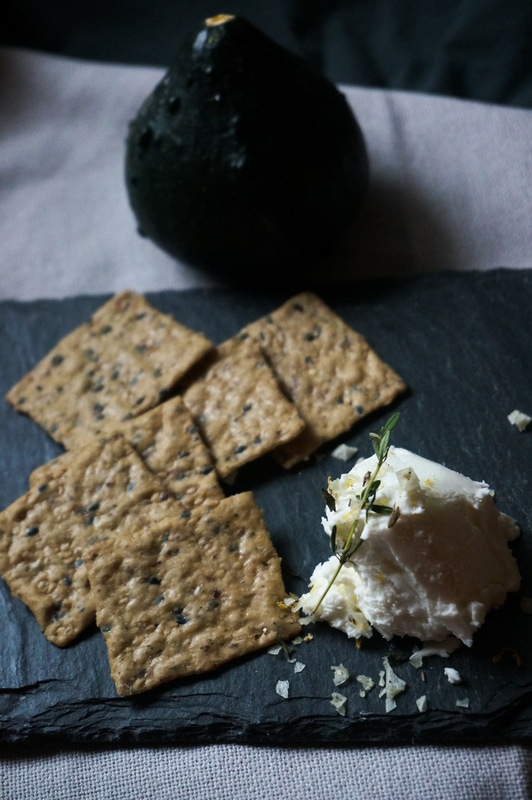 Below, goat cheese and herbed citrus sea salt create a beautiful appetizer spread. 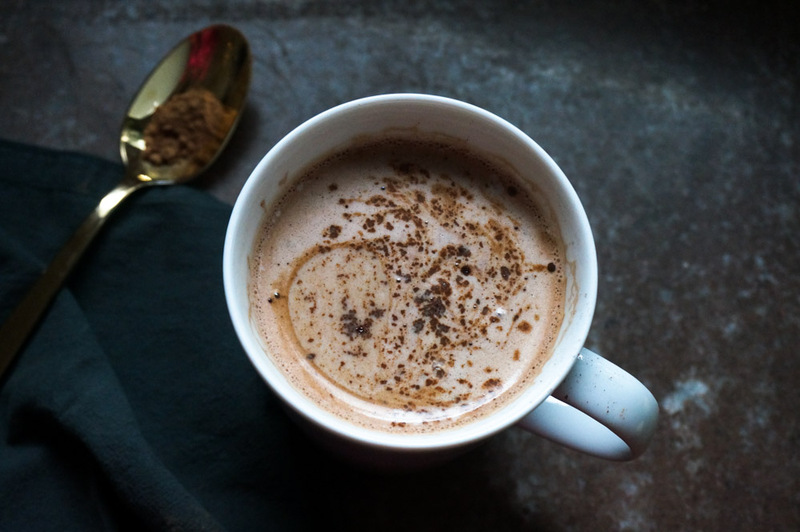 A recipe featured in this post from Athena Calderone was our go-to formula for success! Try jazzing up a beloved vegetable with interesting seasonings. 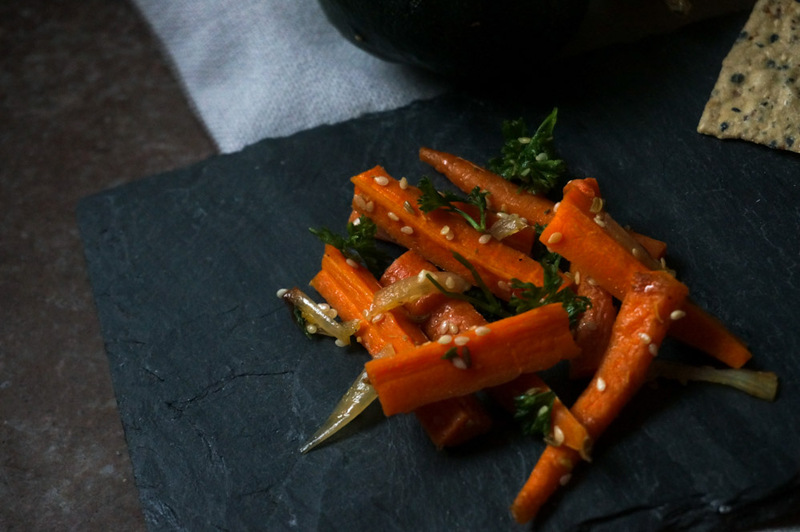 For example, toasted sesame seeds and parsley take roasted carrots to new heights. This recipe from Dolly and Oatmeal was our inspiration. 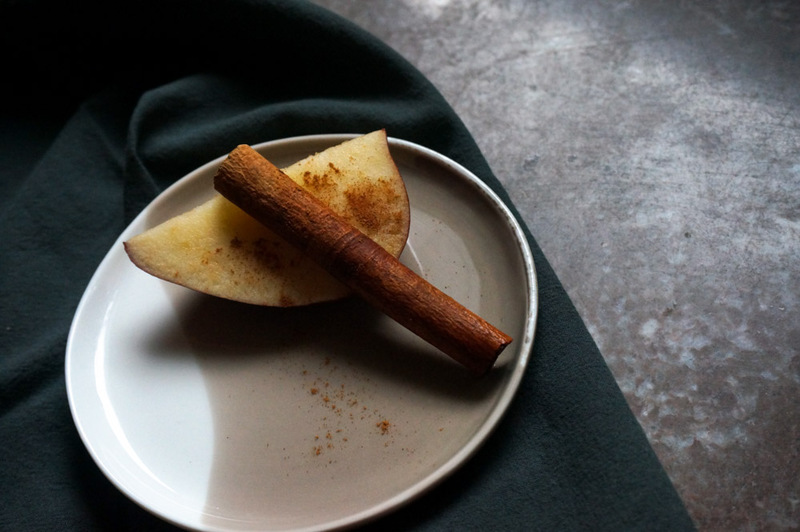 Yes, it’s even better when you add fennel and honeycrisp apple slices! 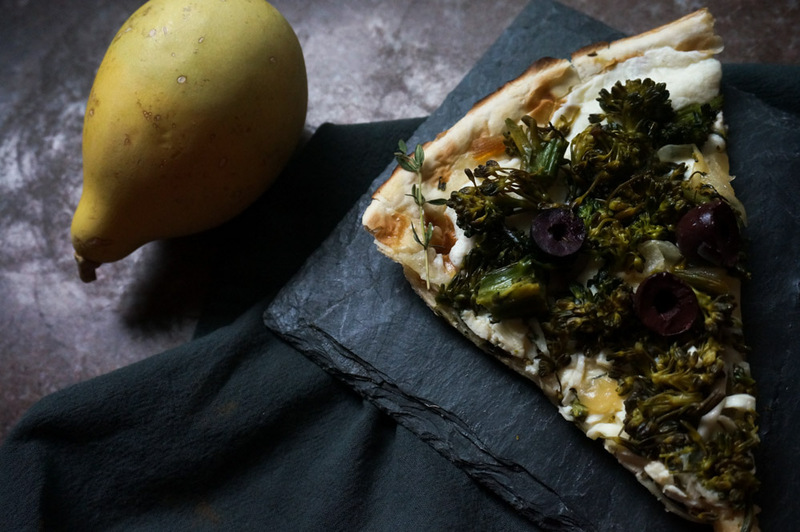 A broccolini pizza with roasted onions is a delicious, low-key take on Thanksgiving cuisine. The bottom line: cook what you love. 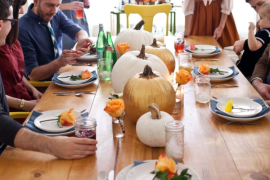 If you’re hosting, pay attention to the dietary needs of your guests, of course. But don’t hesitate to create a different kind of menu based on what you’re craving and what you have time to prepare. Food styling has veered into gorgeous territory in recent years, with a plethora of images featuring dark tones that allow the food to take center stage. When it’s chilly and gray outside, there’s something powerful about embracing it, putting your own stamp on it, and making your table a place for quiet reflection. 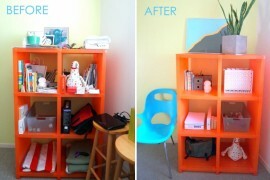 If you’re interested in trying out this look, shop your own cabinets for deep hues. A slate cheese board, earthy pottery serving pieces, dark marble platters, and napkins in shades such as charcoal and taupe all get the job done. 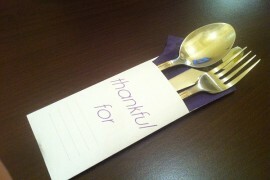 In fact, napkins are some of the most affordable items to purchase if you want to add a dark touch to your table. 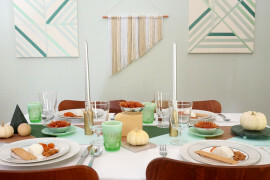 Note how basic white dinnerware really pops against the dark backdrop. 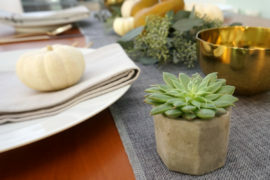 Don’t discount the mood-setting potential of a gray tablecloth or a sepia table runner. Flatware in brass or black is the icing on the cake for a moody palette. If you’re on a budget and can’t purchase an entirely new set, stick with a few interesting additions, such as appetizer forks or coffee spoons. 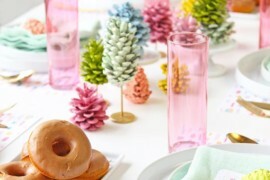 Last but not least, let the food add another dimension of color to your table. 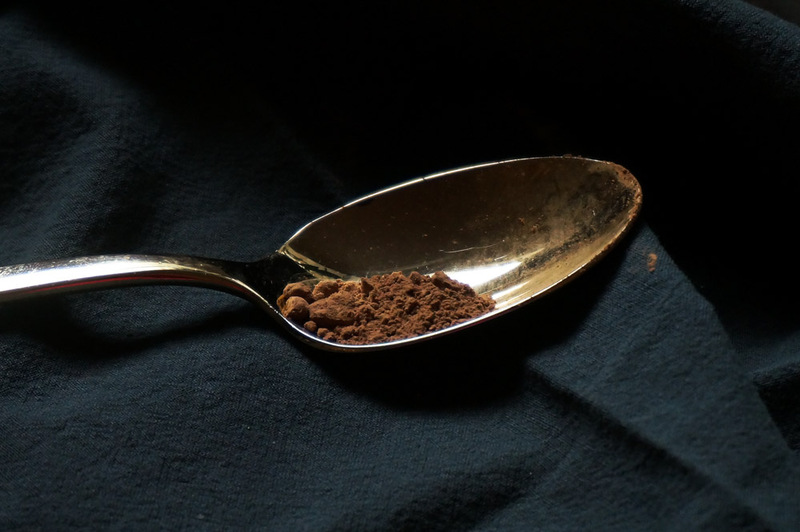 Even the simplest of ingredients, such as cocoa powder, have the potential to shine in this rich setting. 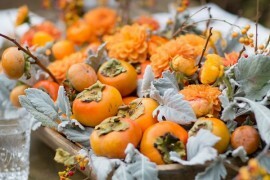 We at Decoist wish you and yours a peaceful, bountiful Thanksgiving!